My friend Molly is an incredible designer and dog lover, so it made perfect sense when she told me she had designed a line of "Doggy Duvets." 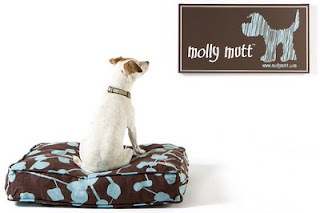 She launched Molly Mutt on Friday and has an online store accepting orders. It's going to be carried at all the big online retailers, but you can buy it from her website for the same price. The beds look great, you can use old clothes, sheets, blankets, etc to stuff them and best of all, you'll be supporting someone who had a dream, and actually made it happen. The video below is funny and tells the story way better than I ever could.